Hurricane Michael slammed into the Florida Panhandle on Wednesday, October 10th, wreaking havoc on the communities that lay in its path. The Category 4 storm, one of the most powerful hurricanes to hit the continental United States in 50 years, brought heavy winds, rain, and flooding to the Florida panhandle and Gulf Coast, as well as Georgia, Virginia, and the Carolinas, which are still recovering from Hurricane Florence. At least 11 people died because of the storm. The affected communities need help rebuilding. 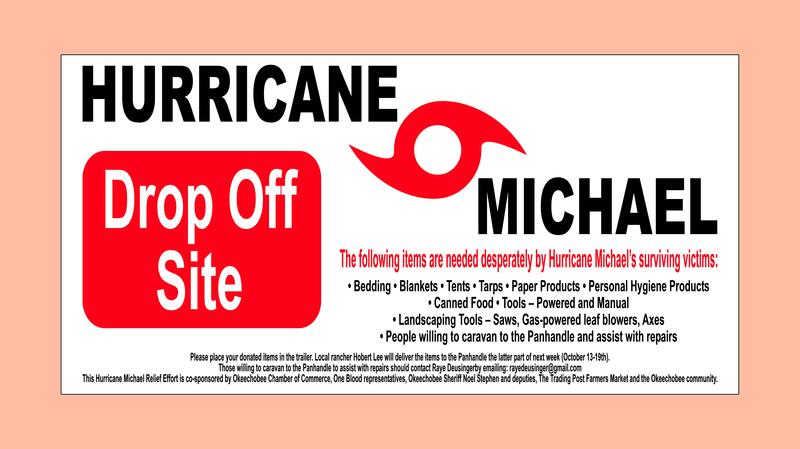 This Hurricane Michael Relief Effort is co-sponsored by Okeechobee Chamber of Commerce, One Blood representatives, Okeechobee Sheriff Noel Stephen and deputies, The Trading Post Farmers Market and the Okeechobee community. The TRADING POST is excited to host FRIDAY NIGHT LIGHTS on Friday, October 12th, from 5 pm through 8 pm. There will be FOOD, FUN, and LOTS OF SHOPPING! The Public is invited and ADMISSION IS FREE! FOR VENDORS who would like to be open during this event, there is a small charge of $9.35 plus sales tax ($9.99 total). Come on in to the Trading Post Office located at 3100 HWY 441 S, Okeehcobee, Thursday through Monday, 8 am through 3 pm to sign up and reserve your space. Set up will be from 3 to 5 pm on October 12th. We hope to see YOU at FRIDAY NIGHT LIGHTS! LADIES AND GENTS: Keep your shiny auto GREATS safe and sound under cover this weekend. In compliance with Florida Governor Rick Scott's message, Trading Post Auto Show will reconvene on a hopefully sunny Fathers’ Day, June 17th, with Pre-Registration on Saturday, June 16th from 10 am to 2 pm, Registration on Sunday, June 17th from 6:30 am to 9:30 am. Peoples' Choice voting begins at 10 am sharp on June 17th with awards at 2 pm. 2 classes: Antique (autos 1989 and older) and Current (autos 1990 -2018). Ladies and Gentlemen, prepare for FATHERS’ DAY AUTO SHOW family fun at the Trading Post Flea and Farmers Market! in the Sunshine State due to a weather system developing over the Caribbean Sea. The weather system, now designated as Invest 90L by the National Hurricane Center, is currently east of Belize and producing a large area of disorganized weather as it slowly moves north into the Gulf of Mexico.